February 14, 2014, 11:10 AM · Menuhin Competition Artistic Director Gordon Back knows how to support a violinist at a competition -- he's been there at the piano for many a young violinist's most trying -- and triumphant -- moments. This year's Menuhin Competition, which begins one week from today in Austin, Texas, has a history that started with violinist Yehudi Menuhin (1916-1999) and continues under the direction of Back. Before taking charge of the Menuhin Competition in 2002, Back had a long career as a collaborative pianist. "I've played with violinists all my life, really, since the early '70s," he said, speaking to me over the phone from London earlier this month. 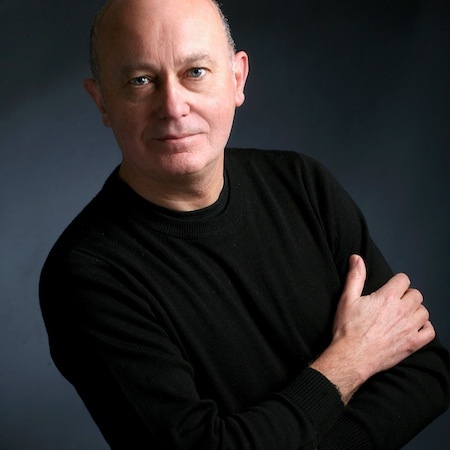 Back has been the official accompanist for the Carl Flesch Competition in London, the Tchaikovsky Competition in Moscow and the Queen Elisabeth Competition in Brussels. He accompanied for the Indianapolis Competition for its first four competitions and of course, for the Menuhin Competition. In fact, he met the late Yehudi Menuhin 40 years ago, when Menuhin asked him to accompany his master classes in London, at the Guildhall School of Music and Drama. All this experience accompanying allowed him to meet some amazing talents, at very young ages. "I accompanied (Leonidas) Kavakos, when he won the second prize (in Indianapolis), then I played concerts in Europe with him when he was in his early 20s," Back said. "I played with Sarah Chang from the age of nine, and Maxim Vengerov when he won Carl Flesch when he was 16. 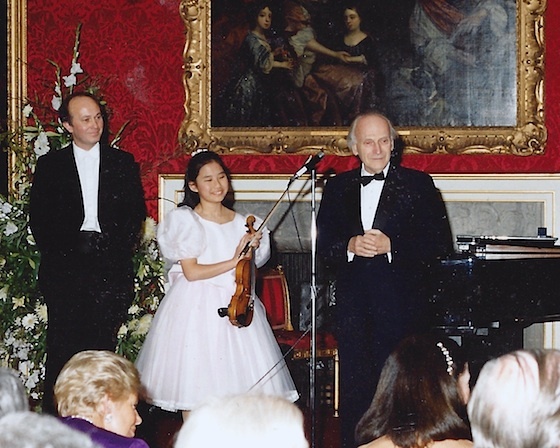 I accompanied Julia Fischer at the Menuhin Competition when she was 13, when she won first prize. So I came across many great young talents then." He was also well-connected with an older generation of violinists, playing with Menuhin in concert, and with Nathan Milstein and Josef Suk. Back was official pianist for the Menuhin Competition from the time it began in 1983, when it took place in the small, seaside town of Folkestone in Kent, England. "What I remember there were these informal master classes (Menuhin) would give," Back said. "It was like the Pied Piper; there would be all these violinists sitting around him, in a very informal way in a room, when he'd be talking about the Bach Chacconne, or the Beethoven Violin Concerto. It was absolutely fascinating." Experiences such as those gave him ideas for how to continue shaping the competition after Menuhin's death in 1999. "One of these ideas was to move it around the world, because the talents were coming from all over the world," Back said. "Also, turning the competition much more into a festival, where the nine members of the jury would also perform big, high profile concerts, depending on who was on the jury, and give master classes." Indeed, this year's jury members are doing all of those things and more, with a full schedule of events that has jury members playing at opening and closing concerts, giving lectures, playing chamber concerts and giving master classes. For Menuhin, the competition was about more than the winners, Back said. "He didn't really care necessarily about the First Prize winner, it was all about discovering the talents, the stars of the future." The whole idea for the competition grew from an idea by violinist Robert Masters, who was the first director of the Yehudi Menuhin School, in Surrey, England in 1963. (Here's the article from when we visited the Menuhin School in 2012.) Masters "was on the jury of a competition in Russia and thought, wouldn't it be great to have a competition for young violinists? Because there are very few in the world for violinists who are so young," Back said. "He proposed this idea to Yehudi, and Yehudi thought this was a fabulous idea. That's really how the Menuhin Competition came around, in 1983." As for Menuhin, "he was very interested in discovering and nurturing this talent of the young ones, but I'm not sure he actually liked competitions a lot," Back said, "so it was about almost trying to create a sort of festival-among-competitors atmosphere. That's a sort of hard paradox, isn't it? Because inevitably, it is a competition, and people will disagree between the First Prize and Second Prize. But for him, you're identifying this talent." A First Prize is no guarantee of a career, and sometimes it's the competitor who wins Fifth Prize who goes on to the bigger career. Certainly, the Menuhin Competition has recognized many gifted young artists who are building or have achieved solid careers, among them: Julia Fischer, Nikolai Znaider, Jennifer Koh, Tasmin Little, Lara St. John, Ilya Gringolts, Ray Chen, and many more. Though they did not all win first prize, many of them had some of their earliest competition experiences at the Menuhin. "Nurturing the talent was very, very important to Yehudi," Back said. "The Menuhin (Competition) is different from (other) competitions, it's not about finding the gold winner and pushing them like crazy, which many competitions do. This is about nurturing the talent and in a way, actually not pushing them. If somebody's incredibly talented, it's almost more about letting that talent develop in a natural way and not getting in the way of it." Menuhin was born in New York City and took the stage at age seven, spending most of his childhood touring the world. At age 19, his world tour included some 73 cities! He spent much of the rest of his life advocating a well-balanced existence. As a teacher, "the biggest influence in (Yehudi's) life was probably (George) Enescu," Back said. "He also drew upon lifetime experiences, sometimes outside of music. He was a great advocate of Ravi Shankar and Eastern music. He was a great philosopher, he was a world citizen. He loved art, yoga. It's all those influences that came out through music, as he got older. He was such an incredibly well-rounded human being; he was much more than just a violinist. You'd always feel this incredible depth of knowledge, and he'd make you think of things that you'd never thought about." Since Back took directorship of the Menuhin Competition, it has also become more of a world citizen, in a sense, as it has moved from place to place. Since 1984 the competition has been held in Boulogne sur Mer in France; London in the U.K.; Cardiff, Wales in the U.K.; Oslo in Norway; and Beijing in China. This year it crosses the Atlantic to the United States, to take place in Austin, Texas. "Some people said, 'Why not New York?' But there's so much happening in a city like New York, I think it gives it a different feel to have it in Texas. The Butler School of Music has a fabulous international faculty, and the school's got a great infrastructure. The UT Orchestra is good, the Austin Symphony is 100 years old, Menuhin performed with them in '52, and of course the added ingredient there, to give it a bit of international flavor, was to bring in an international orchestra, so Cleveland Orchestra are coming for the last three days." "In a sense, the competition reinvents itself every two years because you have the influence of the host nation," he said. "One of the joys of this has been to work with different partners. When we went to Norway in 2010, we introduced improvisation there for the first time; this was something the hosts wanted to bring in. In Cardiff, we got the kids to direct the Four Seasons without a conductor. After that, the obvious thing to me was to take the competition East, because so many of the entries come from China, Korea, Japan. That was one of the reasons to go to Beijing, and that was a spectacular success. Then the question was, where do you go after that? The obvious choice was America, because that's where Menuhin was born, and so many entries are coming from the States now, in terms of people from all nations studying in the States. In 2016, the centenary (of Menuhin's birth), the obvious answer was to come to London because that's where he spent most of his life. So each competition has evolved, has taken a different path." But one thing has remained the same: at the heart, the competition is a celebration of young talent and hard work. This year, the Menuhin Competition had more applications than ever -- 275, and 42 of them will arrive in Texas next week. "There's enormous quality in all the concerts; I think there's a bit of something for everyone there," Back said. "The real stars are the kids themselves, they are amazing, they are just great kids."